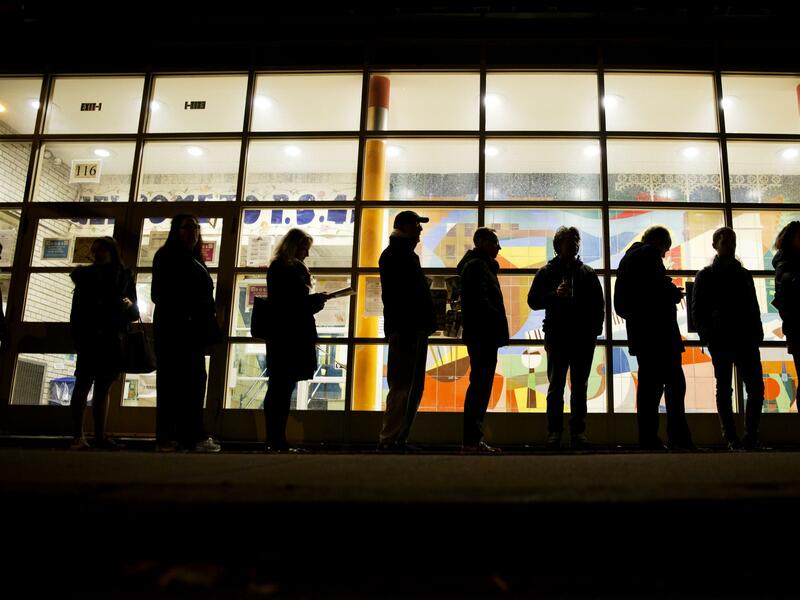 A line of voters stretches down the street as they wait for a polling site to open on Election Day in New York. It was Nov. 4, 2008. My birthday. Election Day. I made my way uptown to Harlem, where my friend Rakia was going to be watching the election returns with friends. I almost never wanted to go uptown — from Brooklyn, it may as well have been a trip to Guam — but that night I felt that I really, really needed to be in Harlem. There were about eight of us, all brown, posted up in Rakia's living room, eating pizza and tweeting and watching the news coverage. When CNN called the presidential race around 11 p.m., a bunch of folks from other buildings in the neighborhood rushed out into the street and began cheering: "OOOOOBAAAAAMAAAAAA!!!!" Barack Obama was going to be the 44th president of the United States. On TV, everyone in Chicago's Grant Park was cheering. Everyone outside on the Harlem streets was cheering. Everyone in Rakia's third-floor walkup was cheering. She looked at me and the other brother there and wanted to hear deep thoughts about this moment. "Come on, black man!" she said. "Say something." Neither he nor I did. I was transfixed by the TV, blubbering like Jesse Jackson. On the long cab ride back to Brooklyn, there were people out all over the city celebrating, dancing and waving flags. The next day, YouTube was full of videos of joyous young New Yorkers clogging the streets, waving huge flags and singing the national anthem. I watched those clips and got choked up. This full-throated patriotism business was fun as hell, I thought. I could get used to it. Those of us inclined to pessimism about America's racial realities — and here, dear reader, is where I raise my hand — had to find some way of metabolizing this new, confounding data point. Damn, I thought. Maybe I need to rethink a bunch of what I understood to be true about this country. Perhaps we hadn't seriously considered the history that we wanted Obama's election to correct, but maybe we had the imagination to try. I felt genuinely hopeful. There were large swaths of America that were not on TV that night. There was not very much cheering, even as the white people in those places, we would later learn, were feeling similarly vertiginous. Maybe they were rethinking a bunch of what they understood to be true about this country, too. And that feeling seems to have gained momentum over the past eight years. You could hear it from the woman in Montana who told my Code Switch teammate Shereen Marisol Meraji that she was terrified of illegal immigrants and Muslims, even as she lived in an overwhelmingly white town with almost none of either. You could see it in the mainstreaming of the "alt-right" over the past year, the nebulous phobias and anxieties that were irritated in no small part by Obama's omnipresence. My old pessimism about America's willingness to grapple with its racist history has long since come back to me, even before the rancor and ugliness of the 2016 election cycle. That pessimism sits next to an understanding that symbolic victories — like, say, representation in our highest offices — still matter. But that symbolism tended to paper over something that is more plainly visible today — a toxic racial animus that has long been swaddled in euphemism. This election didn't create or resolve it. It's all hanging out there now, and I fear the viability of America is at risk. So now I toss it out to you, readers: When you look forward from here, what do you see? We want to hear from you. Let us know below.